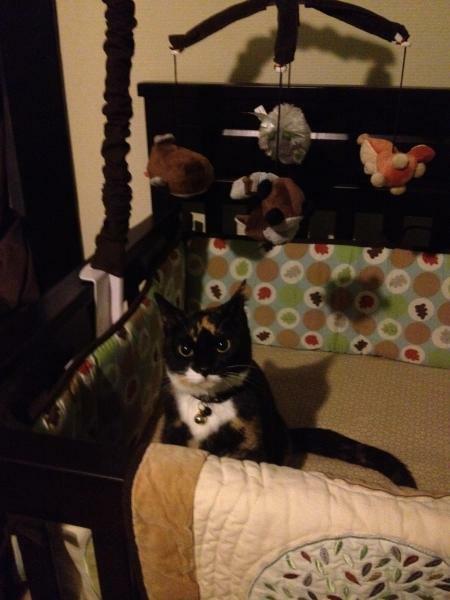 So, just found my cat sitting rather happily in the empty cot, waiting for bub to arrive in October! Keeping the cats out of the room is very difficult. Closing the door results in manic scratching for hours on end plus our appartment is not big enough to close the nursery and our bedroom off from them as they don't like to venture into the dog space. I am trying to close our room off so that when baby sleeps in our room initally theres no big shock for them that they are locked out. Locking them out is not possible and in Winter I don't think that's entirely fair. Getting rid of them is NOT an option. After 7 years of having them I don't want to get rid of them just because we are having a baby. Re: Cats, Cots and Control!! You're not going to like this advice, but I wouldn't worry about it. I had the same concerns when my son was born but our cats (three of them) were no problem -- although they were interested in the cot at first (before my son took up residence), they never tried to hop in when he was in it. In any case, has there ever been a documented instance of a cat harming a baby in a cot? If I recall correctly, the perceived danger is not backed up by facts. ETA: I just found this article which debunks the idea that cats smother babies ... just one source, but the author lists several more, also. Don't worry, once intruder umm baby arrives they will stop sleeping in it, babies make noise and unexpected movements cats don't like. For now put a plastic garbage bag over the mattress to protect it! One of my cats did this as well, before our first daughter was born. I just said a firm NO!, picked him up and deposited him on the floor. 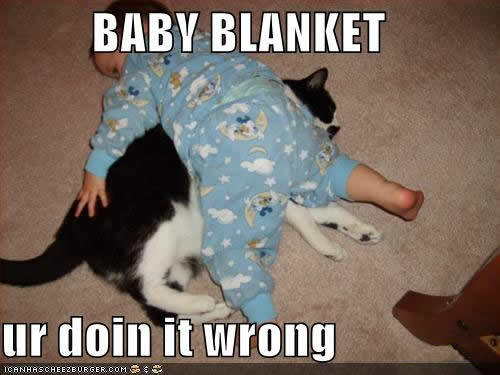 He did this a few more times before the baby came home but never, not even once, did he try afterwards. I think he knew, deep down, that I'd probably never forgive him. He did, however, pick a new spot...the changing table. At least he picked the head of the table to sleep on! When your newborn baby starts bring dead mice home, then it's time to worry. This space is taken - get ur own crib! We're dealing with the same thing, but I'm not overly bothered. I think it's new and exciting because the door is closed, so when we go in we let them in and eventually they get bored of exploring and leave. Also welcoming a little one in October, I'm sure it'll be out of their systems before then. - Lay some aluminium foil over the cot, cats don't like the feel & this will discourage them. - Buy some plastic carpet runner & turn it upside down. Place this in the cot. 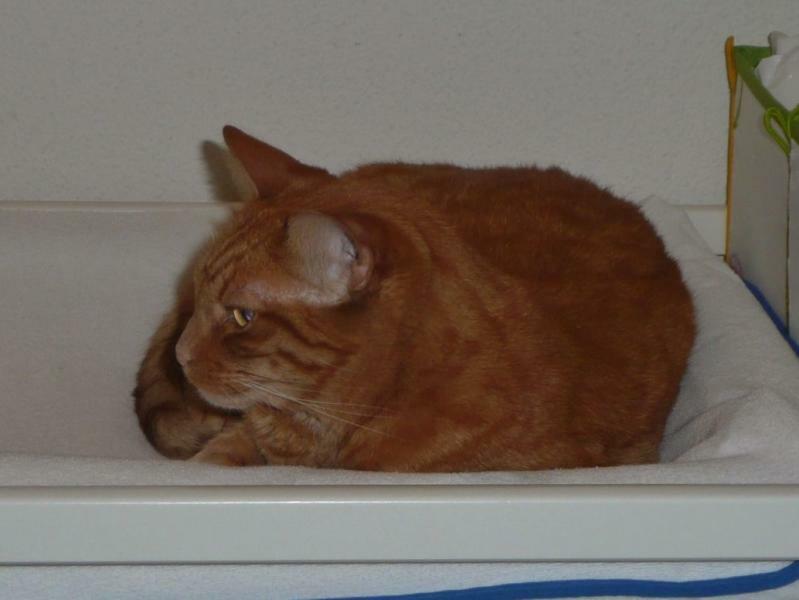 Once again, cats don't like the feel of this & will avoid the cot. - Put some double sided tape on the cot mattress, cats don't like the feel of this. I am totally inexperienced with cats and had read all sorts of horror stories of cats suffocating newborns in their beds because they are warm and comfy. I was really nervous about leaving my son for a night (or even just a nap) at my in-laws where they have a very friendly cat. When my son was asleep in a room we just kept the door closed and switched on a baby monitor. If you are worried, why not get a cat net. Just google "cat nets for cribs" or something similar and you will see where to find one. I had one with my eldest and had no problems with the cat and it certainly reassured me.